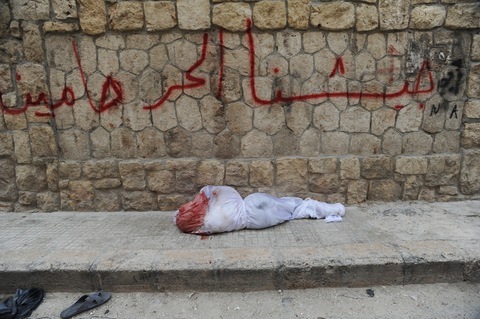 A body wrapped in a bloody shroud lies on the sidewalk as shelling continues on the second day of a Syrian government military offensive against rebels of the Free Syrian Army (FSA) in Aleppo, Syria. Photo by Scott Peterson/Getty Images. Amid heavy shelling, government patrols and helicopters whirling overhead, thousands of Aleppo residents have fled their homes, seeking shelter in dorms at the University of Aleppo. GlobalPost correspondent James Foley visited the university Monday afternoon, Aleppo time, and said he was told by Red Crescent volunteers that as many as 5,000 families were currently seeking refuge at the university. In a conversation with the NewsHour, Foley said that many of the families were from the Salaheddine district of Aleppo, that had been specific targets of repeated government shelling. Salaheddine is in the southwest part of the city, along a route that government reinforcements might take into Aleppo. This YouTube video, uploaded today, purports to show the Salaheddine neighborhood just after a shell has landed amid what appears to be an apartment block. The flames and explosion damage in the video below are also purportedly from Salaheddine, and according to the video’s narrator, caused by a government tank shell. The veracity of the images in these videos cannot be independently verified, but Syrian rebels have been uploading such videos since the start of the uprising. GlobalPost’s Foley also said that some neighborhoods in Syria’s second city “appear normal” and are completely under government control. Foley will discuss the situation in Aleppo with Margaret Warner on the NewsHour broadcast Monday evening. We’ll post that interview shortly after it happens.